What creates a fulfilling and “successful” life? These big life questions can be intimidating and difficult to confront without some guidance. The following books and influential individuals provide their own insights into some of life’s most challenging questions. There are many misconceptions about what goes into creating a good life and how individuals achieve this. These are at least a few to keep in mind. Most people over age 30 have taken a non-linear or circuitous path to their current careers. FACT. While some graduating seniors are confused about their future, the majority have their career paths figured out. FICTION. Our physical health, financial stability, the quality of our relationships and our sense of connection to our communities all hinge on having a sense of purpose at work. FACT. 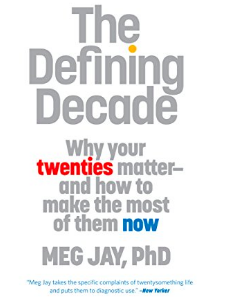 The Defining Decade By Meg Jay, Ph.D.
For Bates students, the main takeaway from this book is probably to pay attention to your life choices, be purposeful in them, and realize that each one should be playing into a bigger picture in some way. Caitie Whelan created The Lightning Notes as a way to “help move the world forward.” The Lightning Notes are a daily post that can be read in 1 to 2 minutes that are meant to leave you feeling good about yourself and the world. Caitie spoke to the Life Architecture class, emphasizing the importance of both generosity and risk taking. Risk Taking: Caitie advised students to categorize the scale of potential risks they can take as a way to reason through what risks we can take casually and which ones might take more thought to accomplish. Gratitude: Caitie’s advice was to focus on acts of generosity you can do for others. She encouraged us to try to do one act of kindness or generosity every day. It is important to think about how you help others when it comes time to ask people for help yourself, whether asking someone for a reference or a favor. Sometimes that act of generosity is just staying in touch with someone even when you don’t have a specific request for them. This helps to legitimize and solidify the relationship, so that when you ask for help, it does not come out of the blue. Experience in Concentration Camps: Viktor Frankl articulately and truthfully tells stories from his experience enduring the unimaginable horrors of life in concentration camps. His reflections on his experience profoundly offer wisdom to any person in any circumstance. Logotherapy: The second half of the book is devoted to explaining Frankl’s original idea, logotherapy, in the context of his experience in concentration camps. Prior to the Holocaust Frankl had been working on his theory of Logotherapy, a theory that would challenge the dominant psychological theories of the time: the Freudian pleasure principle- will to pleasure, and the Adlerian power principle- will to power and superiority. Logotherapy proposes that the primary motivation in human life is the search for meaning. After the Holocaust, Frankl developed and utilized his theory in psychiatric practice and wrote about it in Man’s Search For Meaning to share it with the public. Frankl’s advice can be generalized to anyone who is searching for meaning, whether they know it or not. Though the suffering Frankl endured is unimaginable, his writing is forgiving and shows that he is willing to generalize his extreme suffering to relate to the suffering of a common person. He conveys that there is loss in everybody’s life, though it is all relative. Loss is part of the human experience and therefore his advice applies to anyone and everyone. Maria came from an evangelical Christian home, but left religion behind to find answers to questions that her religion was not answering for her. In her book, and in her life, she has sought to answer the questions religion asks and life asks in a secular way. Throughout this she has discovered that things such as awe, purpose, meaning, death, and tradition are aspects of life that cannot be ignored. Maria presents her findings in a book primarily geared towards parenting, but there is value in it for everyone. Maria spoke to the Life Architecture class and urged us to question everything and make a point to define your own values while exploring what you believe in.